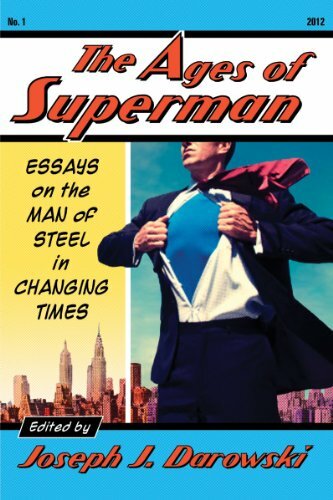 McFarland Press has published a collection of essays on Superman titled "The Ages of Superman: Essays on the Man of Steel in Changing Times". Each essay focuses on a Superman story and its relation to American culture at that time. The essays are ordered chronologically, beginning with an essay on the portrayal of Asians in WWII Superman comics and ending with an analysis of the "Grounded" storyline. To be honest, this book wasn't at the top of my reading list. Anything with the word "Essay" attached to it doesn't exactly sound like rivetting reading. However I was pleasantly surprised by this book. The content is not only engaging, but insightful. As an Australia, I wasn't actually too interested in the historical connection between Superman and what was going on at the time poilitically and culturally within America at the same time, however there's no doubt that Superman is an American icon, and generally his stories have reflected the attitudes and trends of the time. Naturally I was most interested in the essays that reflected the time period within which I've personally been following Superman. However I was also very eager to learn about the reactions to Superman in the 1930s and 1940s, and his rise to popularity and how society and the media of the time reacted to the Man of Steel. Equally interesting, and somewhat reflective of current times, are the essays focusing on Superman of the 1980s and the reboot of the Superman comic books by John Byrne in "The Man of Steel" miniseries. The essay on this era gives a great account of how Superman's relaunch was handled by DC Comics and how the media reacted to it all. I've often wondered how fans and media of the time would have reacted to John Byrne's relaunch had the internet been around then. This book gives us the next best thing. Through detailed accounts and thorough research of newspaper and magazine articles of the time, we get a real insight into just how it all played out in the 1980s. Indeed each chapter/essay (there are 18 in total) is finished off with detailed references and sources, giving both chapter notes and bibliographical information, showing that each writer has done a lot of research and background work. This book is definitely something you should read if you're interested in the history of Superman, and how his stories reflect American society of the time. You can purchase "The Ages of Superman" from our Online Store.